With all of the Poke shops popping up all over the place in Vancouver, it might come as a surprise that my recent visit to Pacific Poke was only the second one I've tried. There are several reasons for this. 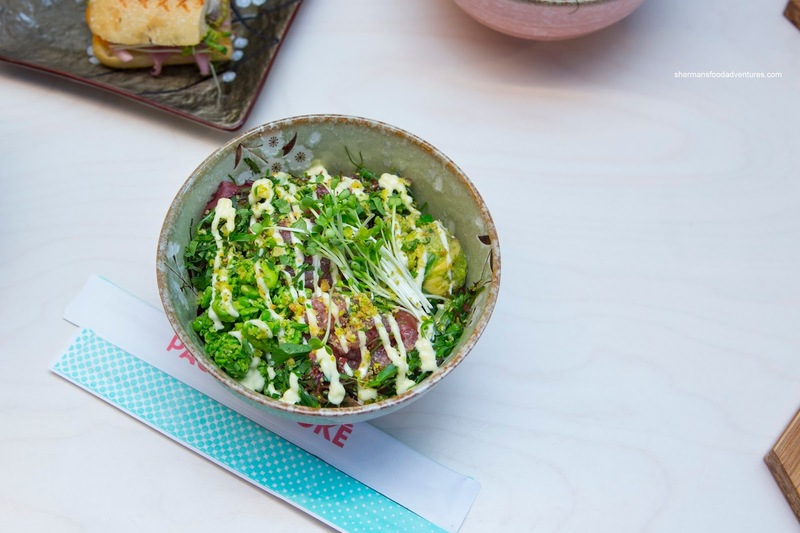 First, I've had Poke several times in Hawaii and nothing I've seen so far in Vancouver resembles Poke (I know this goes against what I usually say, but it's true!). Second, most opened when it was Fall/Winter and I wasn't in the mood. Third, it just seemed like an overload of sorts that I just never go into. 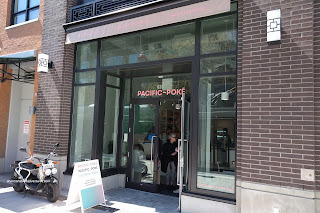 An invite by vancitytastes to Pacific Poke finally got me off the couch and back into the Poke craze. We were presented with 3 of their most popular bowls to sample including The Cali consisting of spicy salmon, crab and shrimp, pickled red onion, avocado nori, green onion and sprouts and spicy mayo. This was the spiciest of the 3 due to the spicy salmon and mayo. The whole thing was creamy with tang from the pickled onions. With the addition of crab & shrimp, there was a certain brininess as well. The second bowl was The Keefer sporting ahi and albacore tuna negitoro, avocado, nori, fresh wasabi peas, mixed herbs, classic sesame shoyu and lime juice. Loved how the creamy avocado contrasted the chewy seasoned rice. Again, there was a certain creamy butteriness to the combo as well as plenty of crunch from the wasabi peas. There was also plenty of tang from the lime juice and aromatics from the sesame shoyu and sesame oil from the wakame. My favourite of the bunch was The Main with salmon, spicy tuna, crab and shrimp jicama, cucumber, avocado nori, sesame miso sauce, lime and yuzu juice, green onion and fresh herbs. This was spicy but balanced with hits of sesame from the miso as well as a rich mild saltiness. The creamy avocado added body while the jicama provided a refreshing crunch. Yuzu and lime juices provided brightness and tang. 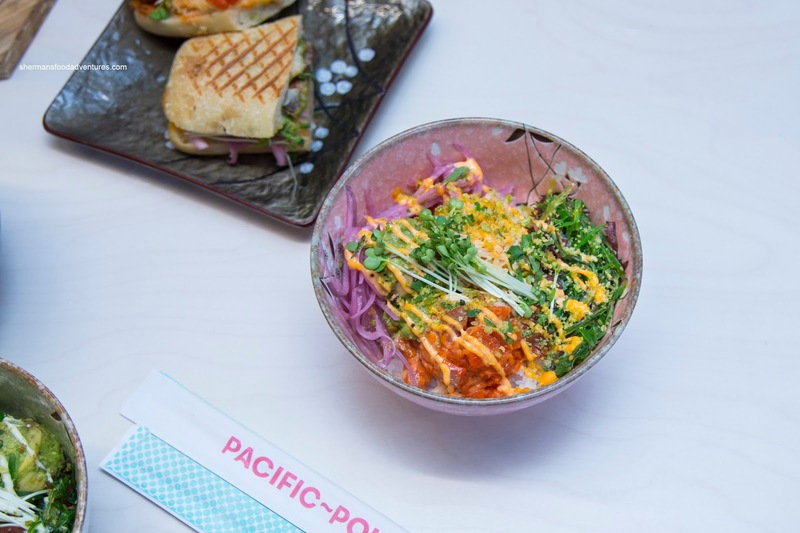 While eating this bowl, it completely embodied what they are doing at Pacific Poke. Their creations are crafted by trained chefs where flavour profiles and textures are taken into account. Hence, this is not supposed to be just a plain ol' Poke. Upon finishing, we were also able to create a Custom Bowl to go and I went ahead and loaded it up with negitoro, spicy salmon and spicy tuna. I chose half sushi rice and half quinoa with beets and basil, wakame, fresh pineapple and wasabi peas. This was finished off with lime, citrus dressing and wasabi mayo. As you can imagine, this was hearty and actually satisfying in portion size. It was pretty spicy due to the ingredients chosen, but there was a good amount of tang too. The quinoa lightened things up a bit instead of all rice. 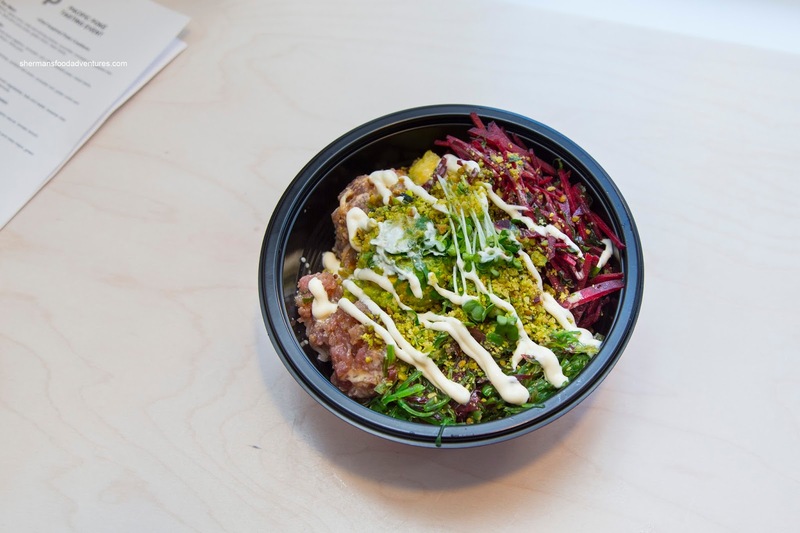 Now, if you read my last visit to a poke joint, I lamented that it just wasn't "Poke". 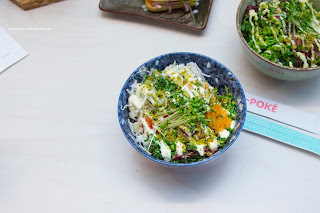 The stuff at Pacific Poke is a variation of Poke, but unlike last time, I enjoyed it since they put some thought into it. The flavours worked and the textures as well. I liked how they didn't put everything but the kitchen sink into it either.